To cycle to a farmers market returning with a rucksack full of produce, with eggs tucked carefully down the side and celery sticking out the top - is to those in the know - one of the great joys of London life. Diego and Vivienne will do a free safety assessment on your bike, a thorough yet quick £20 “Sunday Service” or, give expert advice on anything from how to fix a puncture yourself to road safety and interesting local cycle routes. They’re generous people and are brilliant with children - and Diego’s market playlist is famous! The London Bike Studio is usually with us the 1st and 3rd Sunday of the month so check this week’s list to make sure. Live music is a regular feature of the market. Luke the virtuosic jazz clarinetist is one local talent who frequently performs. Another is Aaron Curtis, blues guitarist…from time to time the market hosts a live band in an effort to drown out the music festivals in Finsbury Park. This is called the “Finsbury Fringe” (details always available on the website). One of Haringay's most intriguing talents, Alan Briggs is a craftsman, naturalist, grower, conservator, designer, teacher and technician. Each week he brings his unique "green roof" insect sanctuaries along with a marvelous selection of cacti and succulents, laser-cut badges, leather wallets and various other inspired creations. Aided with both skill and zeal by his friend Paulette he also hosts donation-based workshops for children with all proceeds going towards local charities. Carol Weatherstone is deeply versed in the science of natural health and wellbeing. Offering a range of holistic treatments and alternative therapy courses, she specializes in reflexology, aromatherapy, deep tissue massage, counselling, diet and nutrition, Indian head massage, manual lymphatic drainage and reiki healing. Central to all this are her organic skincare products all of which are 100% natural and free from parabens, SLS, synthetic colours, preservatives & petroleum based ingredients. 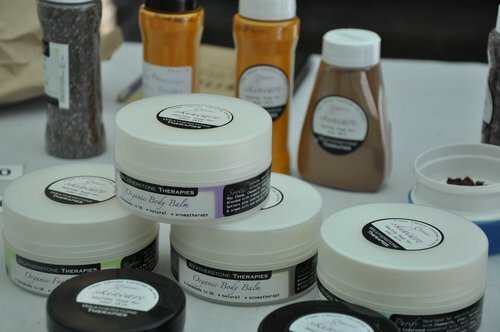 At the market you'll find her full range of products as well as the option of a brief massage or "taster" therapy session.